This software provides a comprehensive toolkit for seismic data inversion and wavelet estimation. Excel uses it as quality control tool, as well as providing our clients with P-impedance, S-impedance, and elastic impedance models. 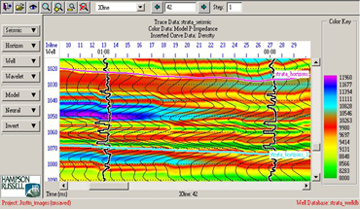 The Strata software offers a number of inversion algorithms. Model-Based – A generalized linear inversion (GLI) algorithm, the model-based approach attempts to modify the model until the resulting derived synthetic matches the seismic trace within user selected, acceptable bounds. 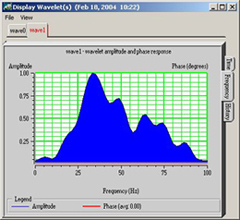 Band Limited – The classical recursive inversion algorithm, it ignores the effect of the seismic wavelet and treats the trace as if it were a set of reflection coefficients. Sparse Spike: Strata offers two sparse spike inversion algorithms. Linear Programming: This algorithm creates a sparse spike reflectivity that produces the best match between the derived synthetic and the seismic trace, subject to the constraint that the number of spikes should be a minimum. Maximum Likelihood: This algorithm uses the model to perturb a reflectivity series estimated from the seismic data. Neural Network – This algorithm applies a Probabilistic Neural Network to the seismic trace to produce the impedance trace. This method requires the training of at least one network. Colored Inversion – The algorithm approximates an unconstrained sparse-spike inversion by deriving an inversion operator that matches the amplitude spectrum of the seismic to that of the acoustic impedance.